A folding sports wagon is a must-have for active families and sporty people. It can carry many things and can handle almost any equipment that one needs on any given day of sports activities. 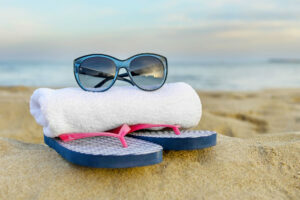 Aside from that, most are less than $100 and can be stowed and carried easily as they are not heavy and portable. 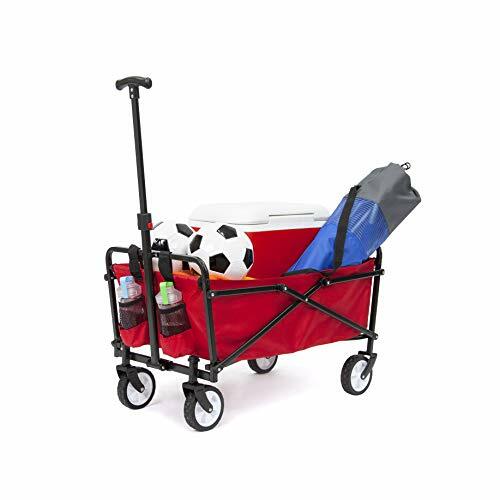 For sporty people who would want to be on the go without ever experiencing a hassle in carrying their equipment, a foldable wagon would be of great use to them. Its versatility extends to almost anything that it can carry – from sports equipment such as football, basketball or baseball items to foldable chairs, clothes, food and drinks. Take it along on camping, fishing and/or picnic trips. Here we are going to find out about the best folding cart that’s available on the market today. Folding sports wagons can look alike, but they may not all function as well as others in some aspects. Though the main point of a foldable sport wagon is to bring you from point A to point B with your equipment, some details must be considered. Below are ten of the best folding sports wagons that you may want to consider. 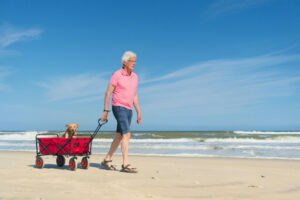 These types of wagon are not suited for the beach sand except the Beachcomber below. 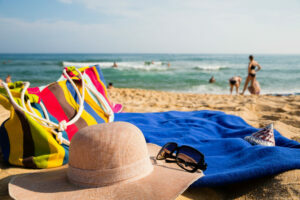 Beach cart reviews are on our main page. Founded in 1993, MAC Sports has grown into one of the largest manufacturer and distributor of collapsible folding furniture in the world and has branched off into other product categories – i.e. garden furniture, juvenile furniture, etc. This growth has been driven by and will continue to be governed by product innovation and unparalleled attention to quality. 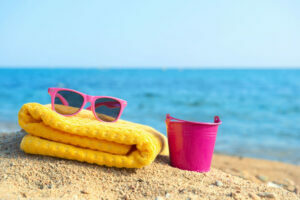 Our products are the Newest and the Best! Great for outdoor activities and even when hauling things around the house. Handle is attached to the front wheels for better steering. Not for the beach – See beach wagons here. 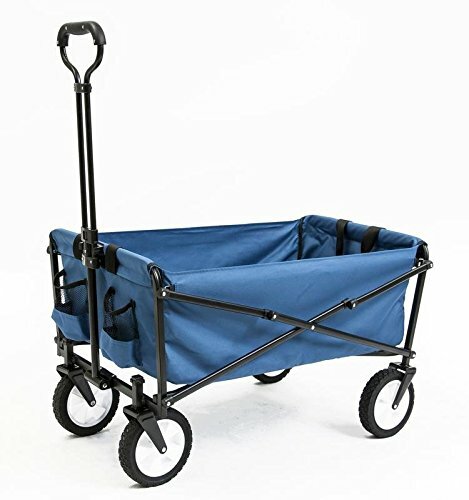 The Mac Sports Collapsible Folding Sports Wagon and Outdoor Utility Wagon is a great choice, especially if you look at its overall capacity and its sturdy construction. It holds a lot of items, with a maximum of 150 lbs so you can definitely take a lot of your sports equipment. Its foldable design is great as it will not take too much space in your trunk or your storage when not in use. ROOMY INTERIOR – Large capacity wagon opens to approx. 35.5″ x 20″ x 22.5″ and sets up in seconds – no assembly required! 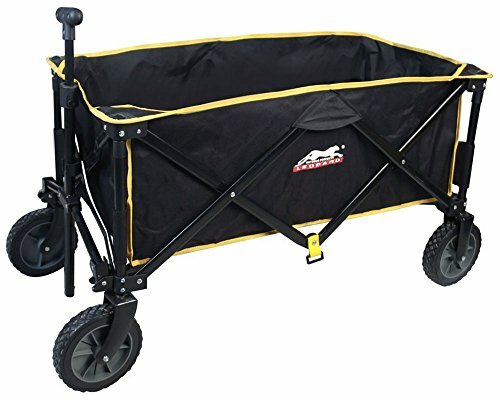 CONVENIENT COMPACT STORAGE – Wagon folds to only 8″ thick! Folded size approx. 29.5″ x 20″ x 8″ and includes a carry case. The original folding sports wagon with extra-wide, rubber, all-terrain tires is now available in team colors! 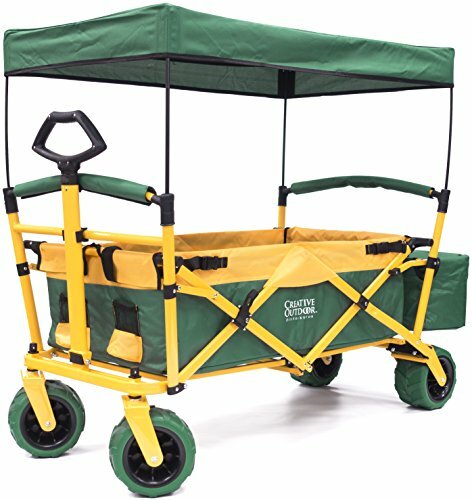 Order yours now and receive a FREE matching soft-sided cooler designed to fit conveniently in the rear basket. While supplies last. 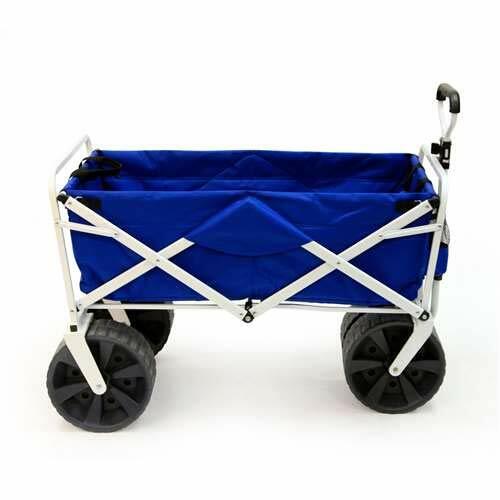 Wagon folds and unfolds in seconds with the simple pull of the toggle. No tools required. 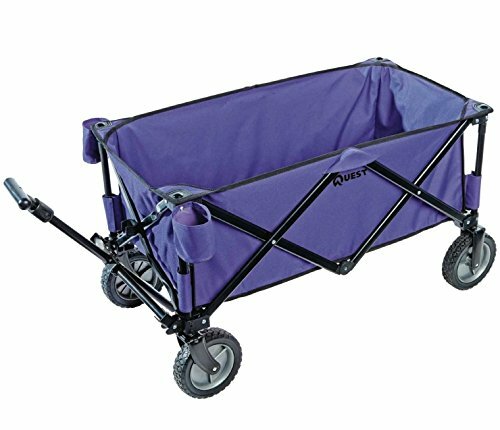 Featuring a strong, folding frame designed to carry loads up to 150lbs and fold compactly to fit in most trunks or store away. The 600 denier fabric stands up to your toughest demands from the mall to the garden. Easily removed for hand or hose washing. Extendable handle to suit your needs. DIMENSIONS: Open – 24″W x 48.5”D x 43”H. 21.5-33.5″ extendable handle. Collapsed and Folded – 24”W x 10”D x 31”H. 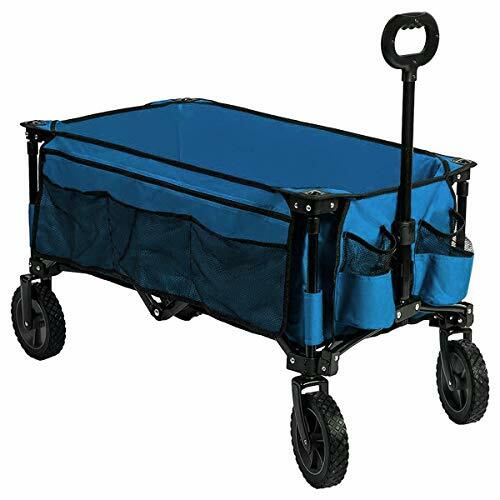 Fabric wagon body interior – 16.5”W x 34”L x 10”H. Weighs 25 lbs. Supports up to 150 lbs. WHEELS: Stylish 4”W x 7”H wheels featuring all-terrain, rubber tread. Front wheels swivel 360 degree for easy maneuvering in sand, snow, or grass. Rides smooth and quiet on smooth hard surfaces. FUNCTIONAL FEATURES – Adjustable handle for effortless transport and 2 mesh cup holders keep your beverage secure. 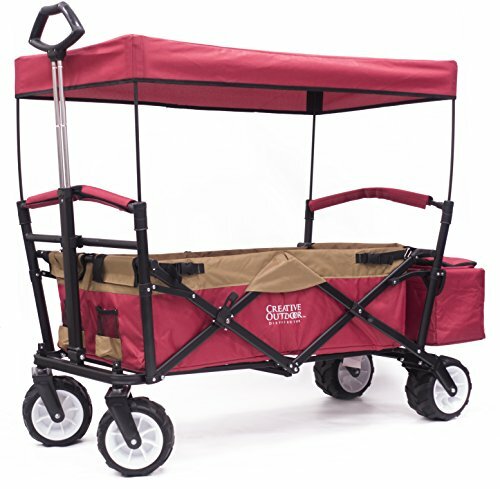 EASY TRANSPORT – Extra large wheels for hauling gear to the beach, outdoor sporting events, concerts, picnics in the park, and around the house. 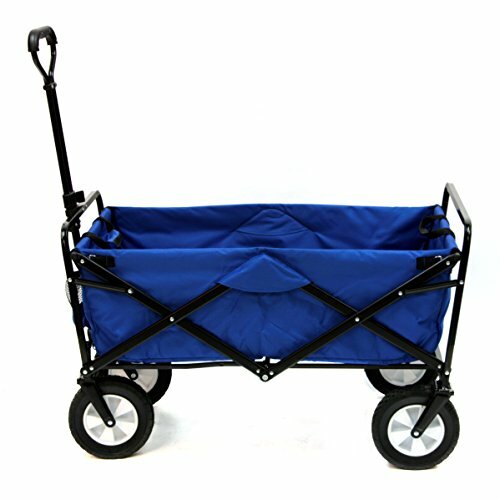 Free standing, able to roll when folded; A carry handle helps rolling easily; Well constructed and pretty roomy, 5 cu. ft. of carrying space;There is a bent in the front and back of the sports wagon which is the design. Sometimes steering could be a bit of a problem – one review. In order to find the best wagon for you, make sure to determine what it is really intended for. 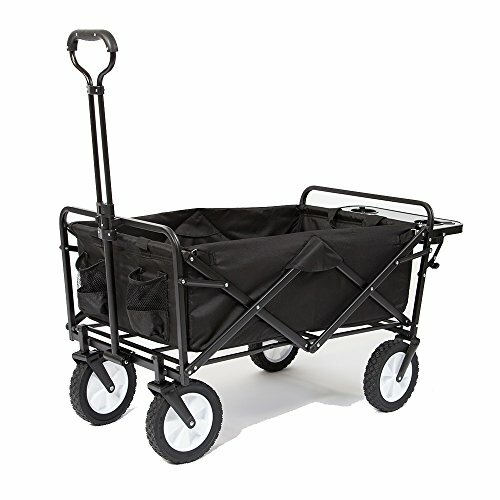 This way, you would be able to determine what is the best foldable wagon to purchase. 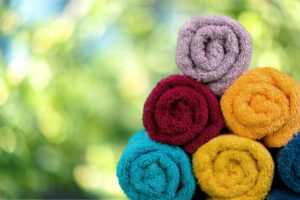 And from there, you can determine the details of the product that you need. Take for example the wheels of the wagon; depending on the terrain (i.e. sandy or rough type) it is mainly used for, the type of wheels must be chosen relating to it. Another consideration is the maximum weight that it can handle. 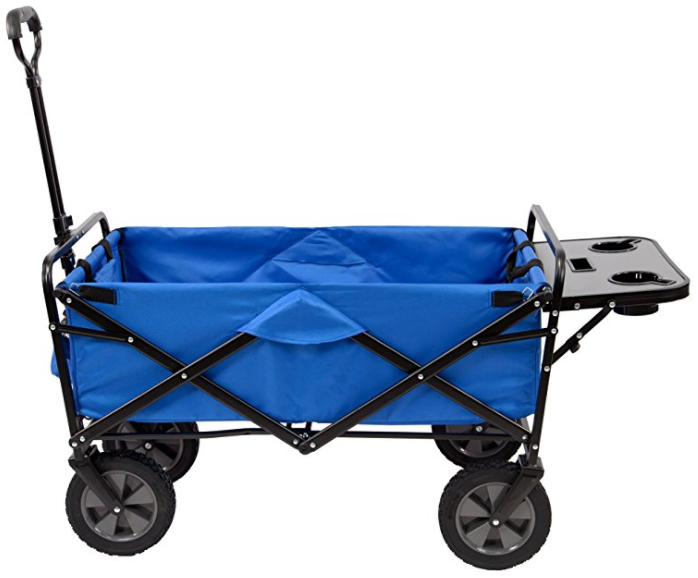 Ideally, it would be nice to have a foldable wagon that has a heavy weight capability. For instance if your child is tired, he/she may be able to ride and have fun at the same time. Some of the wagons are padded for more comfort when hauling the kids. 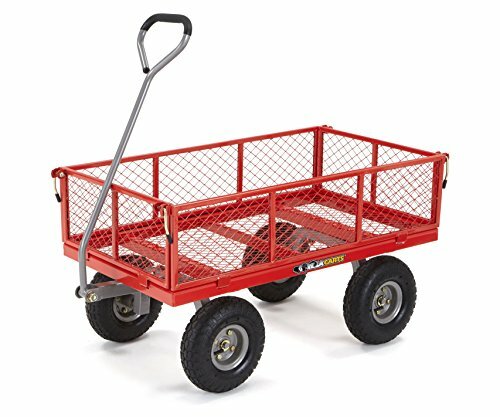 One drawback of it is that having a large weight capability wagon comes with lesser mobility especially when you are not used to carrying around much equipment. All these and more should be pointed out and considered in choosing the right foldable sports wagon for you.